The stator which includes the contact breaker, points, condenser and AC coils. The flywheel which incorporates magnets to create electricity. The basic way this ignition works is a similar version as the electronic ignition, just that it has a different way to trigger the spark. 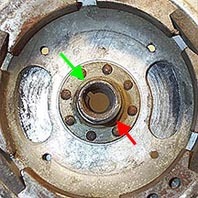 There is a cam built into the flywheel which opens the points once every revolution. When the points separate from each other the an electric charge is fed out to the external HT coil which converts it to a high enough voltage to jump between the spark plug electrode and the grounded side of the spark plug housing. 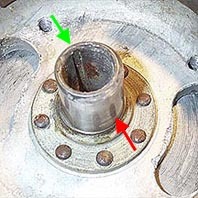 The condenser stops the points from sparking when they are separated which can cause pitting of the points surface and lead to failure. Above is a shot of a stator from a Vespa 150 (VBA1T). The red arrow shows the points which are two small circular faces that align with each other when the contact breaker arm (pink arrow) is closed The blue arrow shows the small off-set screw used to change the contact breaker gap which will be covered in the points timing section. 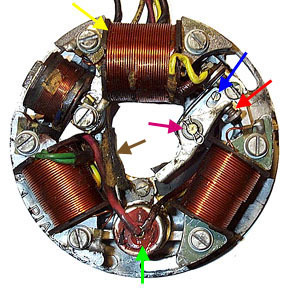 The yellow arrow shows a typical AC coil for generating the power for the ignition circuit. The condenser is shown with a green arrow and can be easily and inexpensively replaced if necessary. The final important part to the stator is the felt pad which lubricates the flywheel cam as it passes on every engine revolution. The cam on the flywheel can be seen above. It is very slight and (maybe) you can see that the side with the red arrow has a thicker wall than the side with a green arrow. When the contac breaker arm rides up on this fatter part the points are pushed open. So how does it all work?? I put together a rough animation below, of the flywheel cam operating the points arm to make things clearer. Note how the cam touches the felt pad for lubrication. Oil must be added to saturate this pad about every 2500 miles.